Huguenot; he was a physician and theologian. Son of one of the Protestant pastors of La Rochelle, after the revocation of the Edict of Nantes he left France for Europe. Personal secretary of Thomas Coxe and of Lord Galway, he arrived in Ireland along with the latter and became the first librarian of Marsh’s Library (1701), to which he added his own books; his Diary, held in Marsh’s Library, is also of interest. Main works: Traité d’Origène contre Celse, ou Défence de la religion chrétienne contre les accusations des païens, traduit du grec par Elie Bouhéreau (Amsterdam, Desbordes 1700, 480 p., in 4°). Bibliography: E. Johnston, The Diary of Elie Bouhéreau, Spottiswoode, Ballantyne 1934; G.L. Lee, The Huguenot Settlements in Ireland, Westminster (London), Longmans 1936 (Baltimore, Clearfield 1993); F.J. Boulaire, Elie Bouhéreau, immigrant Huguenot et premier bibliothecaire de la Marsh’s Library, «Cahiers du Centre d’Études Irlandaises», V, 1980, pp. 7-18; M. McCarthy, Elie Bouhéreau: First Public Librarian in Ireland, «Proceedings of the Huguenot Society», XXVII, 2001, pp. 543-560; R. Whelan, Marsh’s Library and the French Calvinist Tradition: The Manuscript Diary of Élie Bouhéreau (1643-1719), in The Making of Marsh’s Library, ed. by M. McCarthy and A. Simmons, Dublin, Four Courts Press 2004, pp. 219-234; R. Hylton, Ireland’s Huguenots and their Refuge, 1662-1745: An unlikely Haven, Brighton, Sussex Academic 2004. 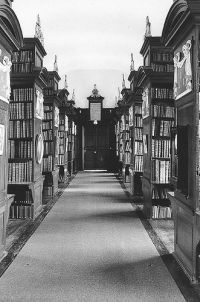 Within Marsh’s Library, the collection which corresponds to Elias Bouhéreau’s library is mostly theological and medical; it also contains books of Protestant controversialism and about the University of Saumur, which he had attended. The collection is divided into five miscellaneous sections (R.1-R.5), with no thematic description, in subsections based on collocation (tabulae) and format. At the beginning of the catalogue is written: «Catalogus Librorum, qui fuerunt Eliae Boherelli (vulgo Bouhérau), è Gallia Religionis causa profugi; nunc vero ab ipso depositi sunt, et Virorum Doctorum usui dicati, in Bibliotheca Publica, sumptibus Reverendissimi in Christo Patris, Narcissi, Archiepiscopi Armachani, totius Hiberniae Primatis (ante Archiepiscopi Dublinesis), Dublinii erecta, ad S.tum Sepulchrum. Continentur in Musaeo inter utramque Porticum posito. Prima classis, dicta R.1. sita est inter Fenestram Occidentalem, et Fenestram Septentrionalem. Numerus autem tabularum incipit ab ima ad summam; et in supputandis tum libris, tum classibus, proceditur a Sinistra ad Dextram». At the end, instead, there is the annotation: «Alios ad hancce Bibliothecam pertinentes Libros vide in H.3 tab. 6 intra Cancellum, pagg. 719-720», which refers the reader to the catalogue of Narcissus Marsh, p. 719, where there is written: «Qui sequuntur Libri ad Bibliothecam quae fuit Eliae Boherelli pertinent». The five sections of the library (R.1-R.5) are topographic indications only, not divisions based on content: indexing them was therefore considered superfluous. Studies on the library: N.J.D. White, Elias Bouhéreau of La Rochelle: First public Librarian in Ireland, Dublin, Hodget Figgis & Co. 1908; N.J.D. White, Four good Men: Luke Challoner, Jeremy Taylor, Narcissus Marsh, Elias Bouhéreau, Dublin, Hodget Figgis & Co. 1927; J.-P. Pittion, Intellectual Life in the Academie of Saumur (1633-1685): A Study of the Bouhéreau Collection, dissertation, Dublin 1969.